Last week some kids may have went to the new film Band Slam, which shows the ups and downs of teenagers playing in a rock/ska band. This week, some fathers may be faced with inspired teens who now wish to start a band and may need some parenting advice on how to help their kids. Once a teenager has assembled their band together, fathers should try to find a decent practice space for the group. A garage with sound proof walls may do the trick, as well as a basement. It’s also important to impose a strict schedule at the beginning to ensure practice doesn’t go past a certain hour. 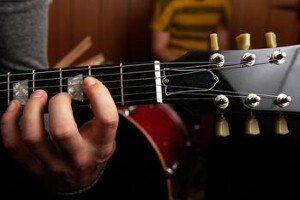 It may also be frustrating for your child’s new band to compose their first song. If this occurs, suggest they start with a cover song (and an easy one at that). One of the important elements of a band is for them to be able to play together. Covering a song that everyone knows will help foster that. When the kids are ready to start writing songs, consider going to the library and pick up a song writing book or look online. One way to help your child get some lyrics down is to buy them a notebook they can carry around with them, to jot down whatever inspiration comes to them. Finally, when the noise starts to resemble music, call around town to local venues and ask whether or not they’ll take in local bands. Don’t worry if the gig is on a Tuesday night and three people show up. This is all part of the evolution of the band. This is a great way for fathers to bond with their children, especially if both play musical instruments. One thing to keep in mind is to manage a child’s expectations and remind him or her that starting a band isn’t about making money and touring the country – it’s about bring people together who love playing music.